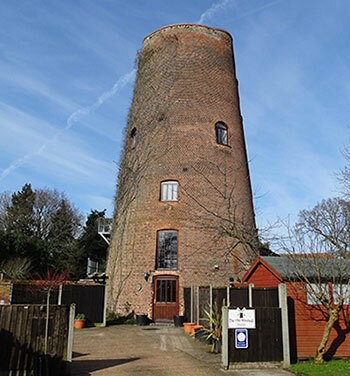 Aylsham's 7 storey Cawston Road towermill was built in 1826 for Henry Soame. The 3 pairs of stones, flour mill and jumper were powered by 4 double shuttered sails, each with 9 bays of 3 shutters. The boat shaped cap held a gallery, an 8 bladed fan and a chain pole. A stage was set around the second floor. The sale details of 1865 record that the mill was running 3 pairs of stones with a further pair being powered by a 6 h.p. steam engine in an adjoining building. Thought you might be interested in a postcard we have found showing our tower mill in 1915. It was sent by a soldier who was billeted in the old workhouse (now St. Michael's hospital) serving in the Royal Veterinary Corps who were occupying the mill and outbuildings during the war. He mentions that he was batman to an officer who was quartered next door in the house now called Oak Lodge. Slightly more luxurious accommodation! Henry Soame died in 1833, a few years after the mill was built and left it to his son George Soame. 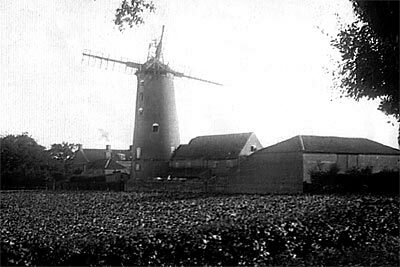 In 1872 the mill was sold for £315 to James Davison, who also ran Buttland towermill in Mill Road. 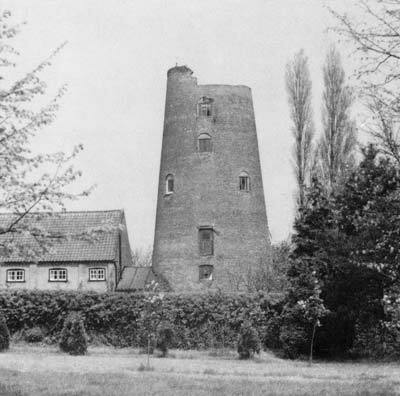 In the late 1890s the mill was struck by lightning and the sails were damaged and not repaired. When the mill was struck by lightning a second time c.1912 a small fire ensued. 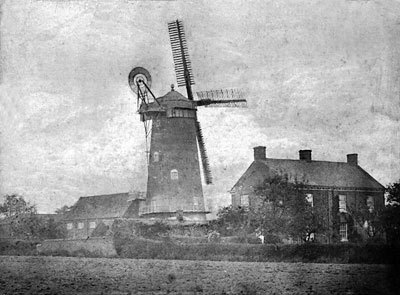 The sails were eventually blown off c.1920 and the mill was destined for demolition. When demolition was started, it was found to be uneconomical due to the tower being extremely sturdily built. The jagged effect of the partly demolished tower summit was therefore left in situ. To be Let For a term of years with Possession at Michaelmas next. A very powerful Brick TOWER WINDMILL driving three pairs of French Stones with Machinery complete. Also Dwelling House, Gardens, Granaries, Stables & other Premises with or without 46 acres of good Arable Land in Aylsham. Apply to W.D. 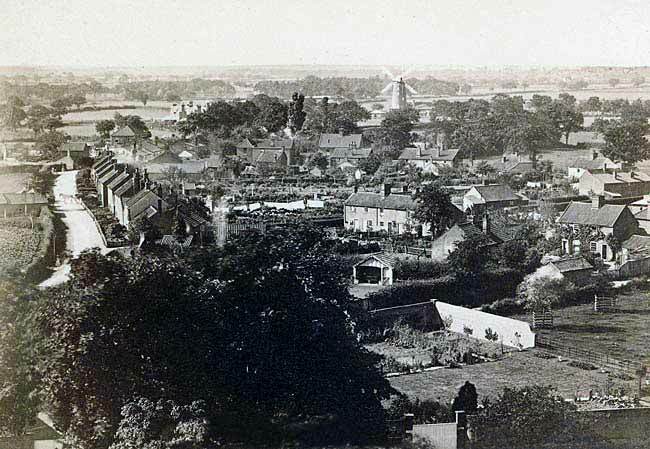 Gardiner, Aylsham Mill, Norfolk. Norfolk Chronicle - 10th & 17th September 1853 & also advertised 5th November & weekly to 10th December 1853 as by W. D. Gardiner of Dilham Mills. By Mr. G.E. Burrell, on Thursday, October 25, 1860 at 11 o’c a.m.
By Order of the Assignee of the Estate & Effects of Mr. JOHN NEECH under a Deed of Assignment for the equal benefit of all creditors. 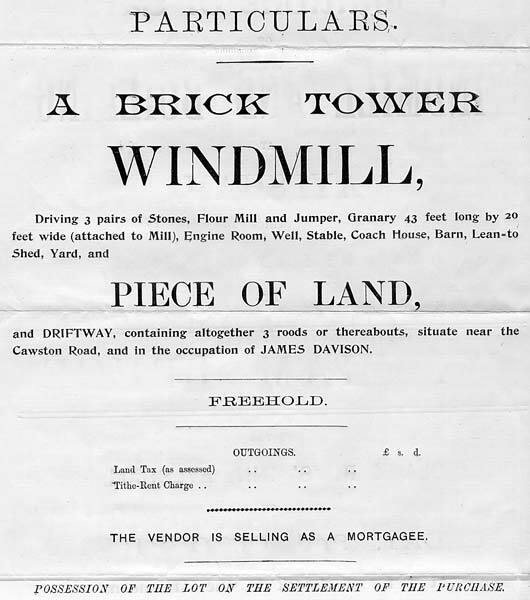 A Capital Brick built TOWER WINDMILL containing seven floors, three pairs of stones, flour mill, jumper etc. Six horse power steam engine (nearly new) driving one pair of stones, flour mill & jumper, with large granary, barn, stables, bullock & cart lodge & other outbuildings. The site contains about one acre. Flour mill & Jumper with large Granary, Barn, Stables, Bullock & Cart lodges & other Outbuildings. The site contains 1 acre. Apply to Mr. Forster, W. Henry Scott, Solr. Aylsham, or the Auctioneer, Cawston. Brick tower mill containing 7 floors, 3 pairs of stones, flour mill, jumper etc. 6 h.p. steam engine adjoining (nearly new) driving 1 pair of stones, flour mill, jumper etc. Large granary, barn, stables, bullock & cart lodges & other outbuildings. Lot 2. A large Brick & Tiles BARN with outbuildings & land containing altogether 2 roods or thereabouts & adjoining the last lot. Lot 1. 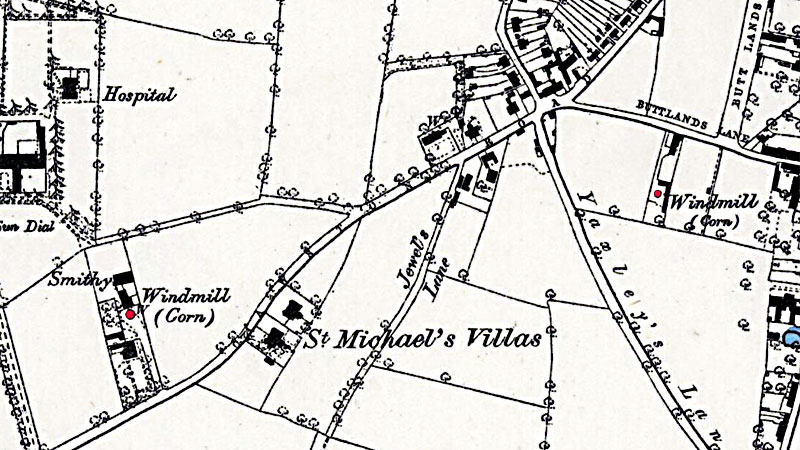 A DWELLING HOUSE near the Buttlands & with Bake Office, Outbuildings & Brick_Tower WINDMILL. Lot 2. 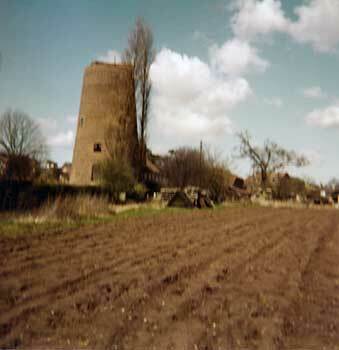 A Brick Tower WINDMILL near the Cawston Road, with Granary, Stable, Outbuildings & Land, containing about Three Roods. Notice is Hereby Given that the Trustee of the Deed of Assignment for the Benefit of Creditors made by James Davison of Aylsham, Miller & Baker, will on the 17th day of July 1896 proceed to Pay a Final Dividend to all Creditors of whose Claims he shall then have had notice. Commercial Union Fire Policy £300. 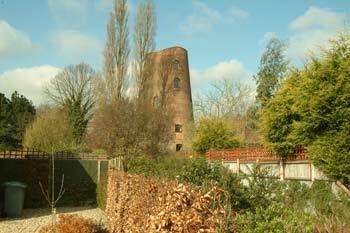 Brick tower mill … at present dismantled & incapable of being worked £100.